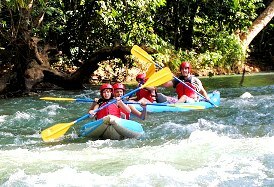 Your white water kayak adventure begins with a 20-minute scenic drive to the historic Rio Bueno River where you will have a short safety briefing and training exercise. Next, take a walk across the swaying "Irie Bridge" for a short hike through the cool rainforest to the starting point of your white water kayaking trip down the historic river. Use teamwork to paddle boldly through different twist and turns of rushing rapids to the midway stop where you can swing on the rope and swim in the clear placid river pool. 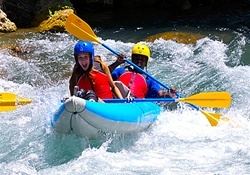 After your stop, climb back into your kayak and continue floating through lush tropical greenery while taking in the amazing scenery as you paddle down river into the Caribbean Sea to a private beach; Have a cool refreshing drink, take a swim in the warm ocean water or just relax before your driver takes you to the next destination or back to your ship/resort. Your river kayaking tour lasts approximately 1-hour, depending on the river current and time you spend at the midway stop. Had a blast kayaking down the river!!! Beautiful scenery...I absolutely had fun and happy we decided to take this trip. Irie vibe!